Revive: to give new strength or energy to. And that’s exactly what the Revive Body Cloths from our friends at Aura Cacia do! 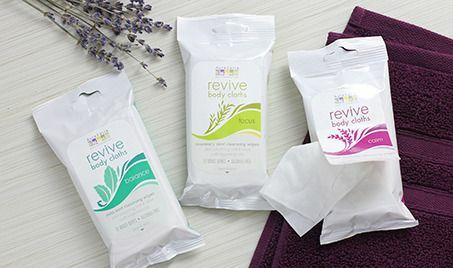 Available in convenient, resealable packets of 12 wipes with oat, aloe, and essential oils, they are just the thing to take on your next camping trip or pack in your gym bag, backpack, office desk drawer, or purse for when you need to freshen up. The wipes are made of a soft, compostable material and contain no parabens or alcohol. Choose from Balance with refreshing peppermint and spearmint, Calm with soothing lavender, and Focus with stimulating rosemary and mint. Three great choices to “Revive” you when you need it!